As we leave the office we will be walking through one of the eight barns that house the many horses here at Meredith Manor. Each barn is designed with the horse's health in mind, therefore they have no interior paint, they have vented pads, and saw dust is used for footing. 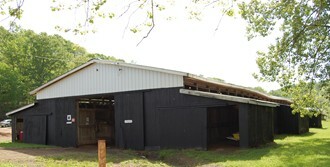 Each barn contains about 20 horses, most of which are provided by facilities from all over the country to be trained by the staff and students at Meredith Manor. Once the program horses reach show level, they are usually sent back to their owners. Due to the large turn around of horses in the program, the staff has the opportunity to continually place students on horses that challenge their riding and training abilities. 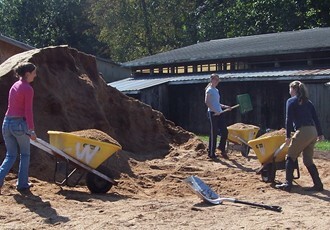 Horse and barn care is an essential part of the program. As a student you will spend about 21 hours per week taking care of your assigned horses which may or may not be the same horses you will be riding in your classes. This care includes cleaning the stall, grooming, scheduling and accompanying the horses to the farrier, alerting the barn manager of any health problems, and routine health care. Horse care on the weekend is done on a rotational basis where students will be responsible for their assigned barn about one weekend a month. This schedule will depend on what the members of that barn and the barn manager agree upon. Also, as part of barn care you will be assigned a weekly duty such as taking out the trash or making sure the ditches are maintained. The next stop on our tour of campus will be Randolph Arena where students get the opportunity to show-off their talents.